Varroa mites (one is visible on the back of this bee) are a major threat to honey bee health and are becoming resistant to two compounds (coumaphos and fluvalinate) used to control them. Beekeepers now have a simple assay to determine whether mites are resistant and thus ensure use of appropriate control measures. Click the image for more information about it. What about cell phones—do they have anything to do with CCD? There was a very small study done in Germany that looked at whether a particular type of base station for cordless phones could affect honey bee homing systems. But, despite all the attention that this study has received, it has nothing to do with CCD. Stefan Kimmel, the researcher who conducted the study and wrote the paper, recently e-mailed The Associated Press to say that there is "no link between our tiny little study and the CCD-phenomenon ... anything else said or written is a lie." Newly emerged honey bee, Apis mellifera, the subject of genome sequencing work aimed at improving bee traits and management. Click the image for more information about it. What is ARS doing about CCD? 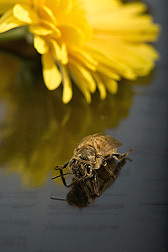 In April 2007, ARS held a Colony Collapse Disorder Research Workshop that brought together over 80 of the major bee scientists, industry representatives, extension agents, and others to discuss a research agenda. They identified areas where more information is needed and the highest-priority needs for additional research projects related to CCD. A CCD Steering Committee, led by ARS and USDA's Cooperative State Research, Education, and Extension Service, developed a Research Action Plan to coordinate a comprehensive response for discovering what factors may be causing CCD and what actions need to be taken. One of the tools that will help in this research is the recently sequenced honey bee genome to better understand bees' basic biology and breed better bees, and to better diagnose bee pests and pathogens and their impacts on bee health and colony collapse. The use of this genome information certainly will have great applications in improving honey bee breeding and management. In September 2007, a research team that included ARS published the results of an intensive genetic screening of CCD-affected honey bee colonies and non-CCD-affected hives. Honey bees devour a new, nutrient-rich food developed by ARS researchers. Click the image for more information about it. This was the first report of IAPV in the United States. IAPV was initially identified in honey bee colonies in Israel in 2002, where the honey bees exhibited unusual behavior, such as twitching wings outside the hive and a loss of worker bee populations. The study also found IAPV in honey bees from Australia that had been imported into the United States, as well as in royal jelly imported from China. Australian bees began to be imported from Australia into the United States in 2005. 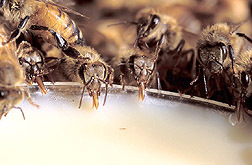 Questions were raised about a connection between those imported bees and the appearance of IAPV in the United States. 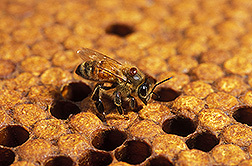 Beekeepers sought out Australian imports of bees as a way to replenish their hive populations. To determine whether IAPV has been present in the United States since before the importation of honey bees from Australia, a follow up detailed genetic screening of several hundred honey bees that had been collected between 2002 and 2007 from colonies in Maryland, Pennsylvania, California and Israel was conducted by ARS researchers. This study in no way rules IAPV out as a factor in CCD. Research by several groups will now focus on understanding differences in virulence across strains of IAPV and on interactions with other stress factors. Even if IAPV proves to be a cause of CCD, there still may also be other contributing factors-which researchers are pursuing. What should beekeepers do now about CCD? Since little is known about the cause(s) of CCD right now, mitigation must be based on improving general honey bee health and habitat and countering known mortality factors by using best management practices. What can I as a member of the public do to help honey bees? The best action you can take to benefit honey bees is to not use pesticides indiscriminately, especially not to use pesticides at mid-day when honey bees are most likely to be out foraging for nectar.